This report summarizes findings from one component of the Consortium for Policy Research in Education's (CPRE) evaluation of the General Electric Foundation's (GEF) Developing FuturesTM in Education program in Jefferson County Public Schools (JCPS). 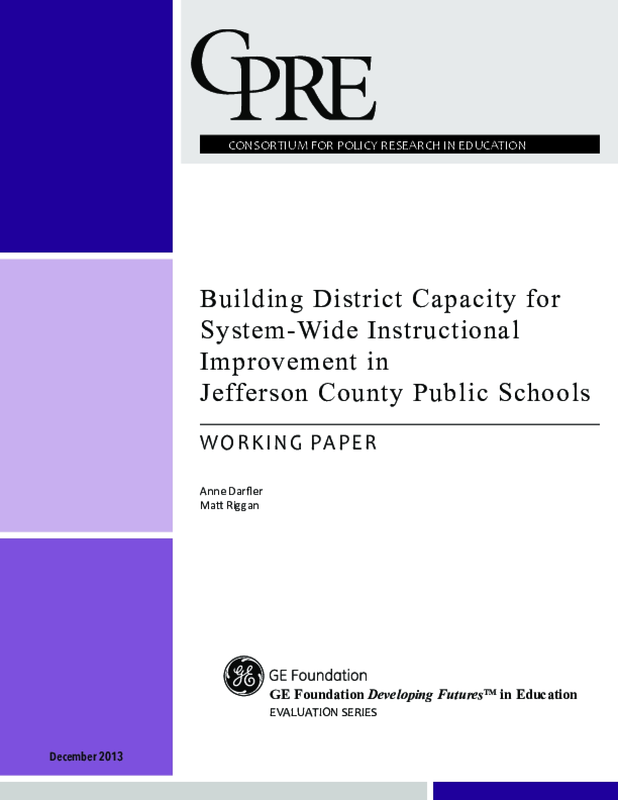 The purpose was to closely analyze the district's capacity to support system-wide instructional improvement. To understand how JCPS, one of the four Developing FuturesTM districts that were examined, built capacity for system-wide instructional improvement, our study focused on a single, overarching question: to what extent has JCPS central office adopted and institutionalized the seven core principles of Developing FuturesTM? Copyright 2013 by Consortium for Policy Research in Education. All rights reserved.